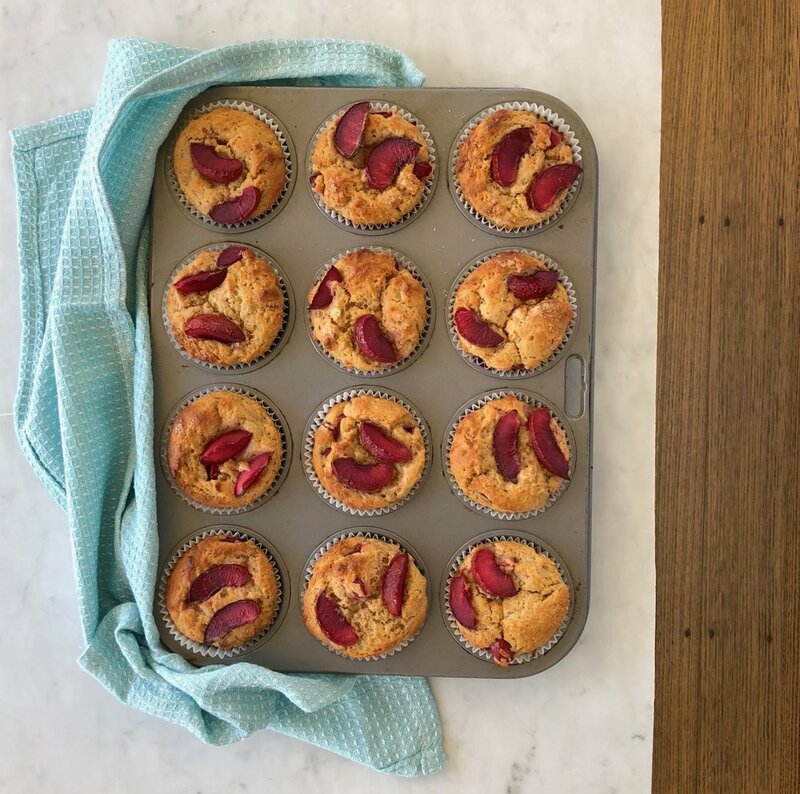 Muffins are a great option for making use of seasonal fruits, and plums will be plentiful over the next few weeks. Plums add a slight tartness, give texture and an eye catching colour to your baking. The Khorasan flour used in this recipe is more nutritious, with a higher fibre content compared to regular processed plain flour. The result gives a dense textured muffin with a rich and nutty flavour. The recipe also works using 50% Khorasan flour and 50% plain white flour. Make a batch (or two) for the week ahead, freeze and add one daily to the school lunchbox prep. For a dairy free recipe see below. Preheat oven to 180C. Line twelve ½ cup (125ml) muffin pan with paper cups. Sift flour, baking powder and spice into a large bowl. Stir in the sugar. In a separate bowl, whisk together the eggs, vanilla, butter and yoghurt. Make a well in the centre of the dry ingredients and pour in the wet ingredients. Fold gently with a spatula until just combined. Add chopped plums and fold until just incorporated. Do not over mix the batter - over mixing will result in tough muffins – it’s okay to have a few specks of unmixed flour and lumps. Spoon batter into prepared paper cups. Cut the reserved plum quarters in half lengthways and arrange two pieces on top muffin batter. Sprinkle the extra sugar over plum pieces. Bake for 25 minutes or until a skewer comes out clean. Cool slightly. Remove muffins from tin and cool on a wire rack. Sift flour, baking powder and spice into a large bowl. Stir in the sugar. In a separate bowl, whisk together the eggs, vanilla, oil and coconut yoghurt. Make a well in the centre of the dry ingredients and pour in the wet ingredients. Fold gently with a spatula until just combined. Add chopped plums and fold until just incorporated. Do not over mix the batter - over mixing will result in tough muffins – it’s okay to have a few specks of unmixed flour and lumps.